This edited tutorial comes to you from Michael Allen Smith, founder of INeedCoffee.com. His full version can be seen here, and his site is here. Check them out! Note that he has much more background and general information in his original tutorial. The Chemex brews coffee using the infusion method, which makes it most similar to drip coffee in terms of body and taste. Its unbleached filters are a little thicker than those used by auto-drip filters. The result is a slower brew and a richer cup of coffee. Although not as rich as the French press, the Chemex does produce a sediment free cup of coffee that will impress anyone used to the weaker taste of most auto-drip coffee machines. A Chemex, Chemex coffee filter, hot water, and coffee. 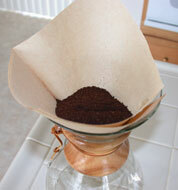 For dosage, Chemex advises 1 rounded tablespoon of regular-grind coffee per 5-oz cup. Like any other brewing method, your best coffee will come after you make your own adjustments to the dosage. By regular grind, they mean coffee ground for an auto-drip. If the coffee is too weak either increase the dosage or grind a little finer. If the coffee gets clogged then use a coarser grind. Although they use a very similar brewing style, the Chemex and the auto-drip have some distinct differences. The first is the Chemex carafe is a heat-resistant glass beaker, not an electrical appliance. This means you will need a kettle to heat the water prior to using the Chemex. One of the complaints with many auto-drip machines is a brewing temperature that is too low. Although it is more work to heat up water in a kettle and then gradually transfer it to the Chemex, having complete control over the brewing temperature can yield a superior cup of coffee. And because it isnt an electrical appliance, the Chemex doesnt keep the coffee warm. It is your responsibility to keep Chemex coffee warm should you brew a full pot. The upside of not being an electrical appliance is you can take it camping. Just be sure to bring a kettle or pot to boil water over the campfire. Chemex coffee also takes a little longer to make. 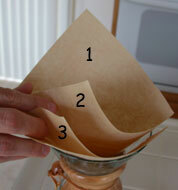 The filters used are thicker than standard drip coffee filters. This translates into a longer saturation period before passing through the filter. Those used to auto-drip coffee will be able to detect the richness difference immediately. Using a drip-grind, grind up the amount of coffee you wish to brew. Note: The Chemex is available in 8,10, and 13 cup models. Setup the square filter inside the Chemex. Note: There are other filters which can be substituted, they should be easy enough to figure out. The following instructions are for the standard square filters. Youll notice the filter is a square folded twice. When you look down at it you will see 4 pieces of paper or 3 sections. Bend 3 of the pieces to one side. Once you separate the filter it forms a cone. This is where the grounds will go. Ive read that you should rest the side of the filter with 3 sections toward the lip of the beaker for better saturation, but my experience tells me this isnt important. Place the ground coffee inside the filter. Once the water boils, remove it from its heat source. Its always good to wait a few seconds before pouring to bring the temperature down from 212° F to the 200-205° F range. The initial pour is very important. Instead of pouring all the water onto the grounds as you would with a press pot, you should only pour enough water to saturate the beans. Chemex states that wetting the grounds allows them to bloom. After you wet the grounds wait 20-40 seconds. During this time trapped carbon dioxide (CO2) escapes from the grounds. The result is the grounds become heavier and they cling to the bottom of the filter. Some theorize that because most auto-drip machines dont do this step, the grounds inside those filters float and thereby do not get maximum flavor extraction. 20-40 seconds after the wetting, gradually start pouring more water. Dont fill it to the very top. Always allow at least an inch of room at the top. Stop pouring the water when youve reached your desired amount of coffee. Once the water has passed through the filter, remove the filter and pour! Like a press pot and most vac pots, it is your responsibility to keep any extra coffee warm. Besides chugging the remaining coffee quickly, two ideas come to mind. The first is transferring any extra coffee to a thermal carafe. Many people already do this with their auto-drip to prevent the coffee from cooking on the burner. The second idea is to place the Chemex on the burner where you heated your kettle water. If you used an electric kettle, then of course this idea wont work. The burner will be cooled from the initial water boil, but it will still be somewhat warmer than the counter-top. An electrical burner will be much hotter than the grate of a gas stove, so Chemex sells a wire grid that fits on top of the electric burner to prevent your glass brewer from cracking. If you decide to go this route, be sure to find a cover for the top to prevent heat loss in that direction. If the water passed through the filter as fast as a typical drip brewer then your grind is probably too coarse. Otherwise your dosage could be too low. A combination of using a finer grind and more coffee should produce a more robust cup of coffee. Reduce your dosage and try again. Although a small amount of water at the end of a brew cycle may not pass through the filter, the majority should. Consider a slightly coarser grind. Are you a home roaster? Super fresh coffee will have more CO2 in it than something roasted at the store a few days ago. Ive found that super fresh coffee takes longer to settle after the initial pour. As long as the majority of the grounds have settled this is not an issue. Ive even experimented with have a 2nd round of pre-wetting with beans just out of the roaster with good results. As stated in my press pot article - I feel your pain. Buy the Bodum Ibis electric kettle. You will thank me. 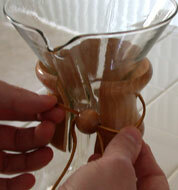 In Uncommon Grounds, author Mark Pendergrast stated the Chemex was difficult to clean. I disagree. Its a piece of glass. Rinse it out with hot soapy water. If it needs something more then it is dish washer safe. Just be sure to remove the handle. Untie the leather knot and the handle will fall right off. So does the Chemex make good coffee? Yes, but like many brewing systems it takes a little patience to find your sweet spot. The first few pots I made I found the body too thin for my liking. After tweaking the dosage and grind, I was able to make coffee that approached the richness of the press pot. However, the Chemex brewer is not for everyone. If you arent a hands on coffee person then you wont enjoy the Chemex. 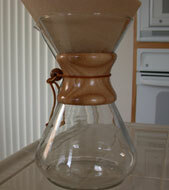 If you dont mind the hands on approach and want a superior drip brewing system, then you should consider the Chemex. Michael Allen Smith is the founder of INeedCoffee. When he isnt drinking coffee he works as a Senior Software Engineer for an energy management company in San Diego, CA. American chemist Peter Schlumbohm (1896-1962) invented the Chemex brewer. It was released by the Chemex Corporation in 1942. This was during a time when 64% of all household coffee was made using a percolator.